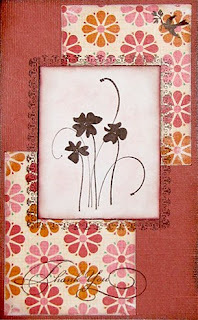 I've had a chance to get a couple of cards done this weekend, one for Jewls' Monthly Card Challenge over at Scrap-Pile... I loved this sketch Jewls!! Thanks for the challenge. and this one's for Challenge #1 for the Clayton's Retreat over at LSS. I've also finally finished the patterned paper for Maree, as a result of the PP Challenge that we started over 2 weeks ago now. I hope you like it Maree, and I hope you find inspiration for a layout in these to complete the challenge. 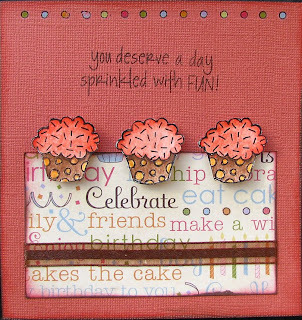 TOP LEFT - Painted then embossed AL stamps in gold. TOP RIGHT - Painted a base cream colour, then painted giant bubblewrap in two tones and stamped, then chalked the edges. 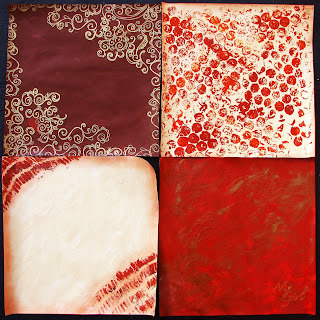 BOTTOM LEFT - Painted a base cream colour, then used a piece of material Deb (Blurose) gave me as a RAK as a mask and painted over in the red colour, then chalked the edges. Leah, I love your new card. What a great design & beautiful colours & details.